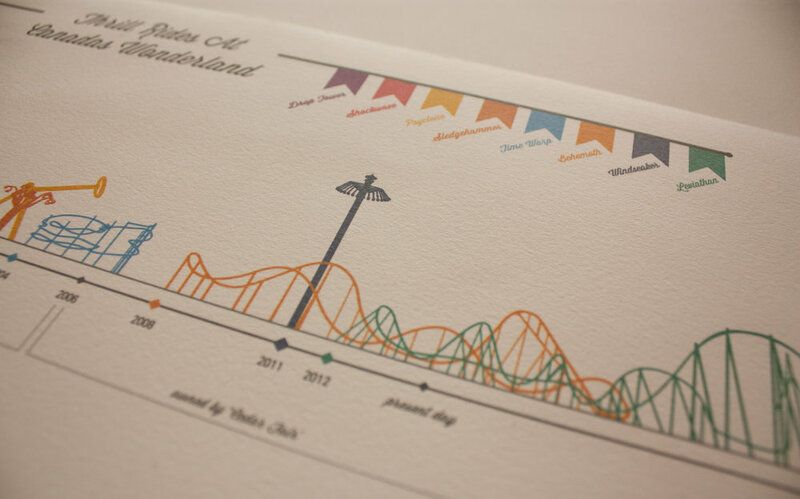 The idea for this project was to create an infographic that efficiently and interestingly conveys data about Canada's Wonderland Theme Park in Vaughan Ontario. The project involved sorting large amounts of data into a format that is both easy to understand and enjoyable to look at. I decided to categorize and make a time line of Canada's Wonderland's 16 most popular thrill rides. I colour coded each ride so that I could also create graphs representing the height, length of track, (if it was a roller coaster) and speed, (in terms of how long it takes a rider to complete one ride cycle). The time line not only shows when each ride was introduced to the park but also who owned the park at that time. 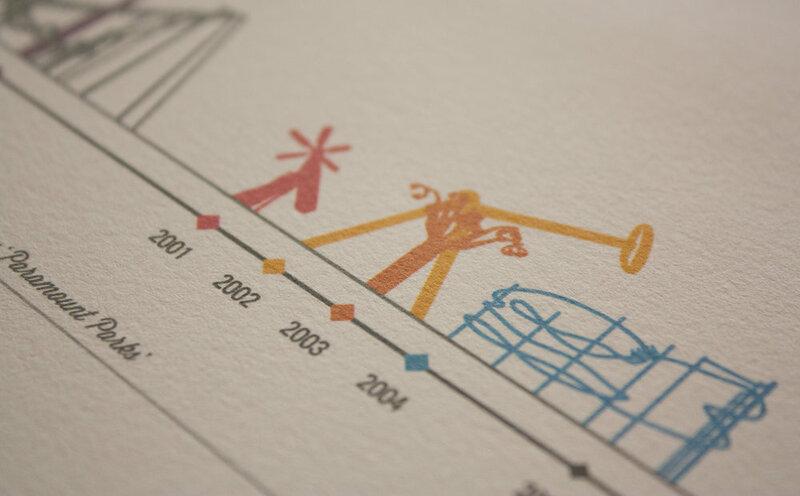 One of the most challenging things about making this project was creating the representations of the rides. I wanted to give enough detail so that the rides were instantly recognizable to people who had been to the park, but at the same time simple enough that they wouldn't confuse the timeline. I also wanted to try and make the rides to scale with one another, which lead me to drawing them on tracing overlays over a grid with their marked heights. Although I tried to do this as much as possible, I ran into issues because of the sheer size of some of the rides. Even though the size differences are not as exact as I initially intended, they are still a fairly good representation of the rides in relation to one another.